Sony launches MDR-XB910 'Extra Bass' headphones | What Hi-Fi? Sony has released details of its new MDR-XB910 headphones, which lead the company's range of 'Extra Bass' headphones. The Sony MDR-XB910s come with an inline mic and remote control, and are set to go on sale this month, March, for around £200. Taking their cue from "the latest music trends", the 'XB910 headphones claim to deliver "extreme sub-bass". No doubt with the huge-selling, Beats by Dre, bass-heavy sound in mind. The headphones are a closed design, sport 50mm dome drivers and claim a 3Hz to 28,000Hz frequency response. 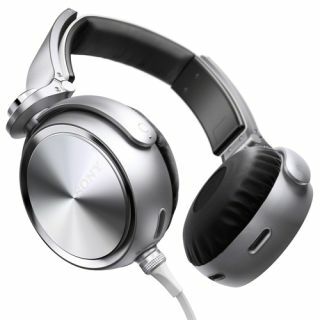 The headphones weigh around 305g and come in a smart aluminium finish with a 1.2m detachable cable (complete with mic and remote). Sony seems to be making a renewed play at the UK headphone market this year, with the launch of a series of new headphones backed by some heavy marketing and music artist backing. The Magnetic Man supported Sony MDR-1R headphones, for example. The new Sony MDR-XB910 headphones are due on sale this month with a price tag of £200.